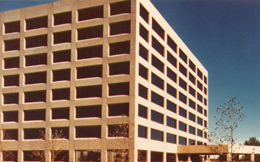 This precast concrete building was designed by the Architect's Collaborative and was completed in 1975. The building incorporates 192,000 SF of first-class office space and is located in Echelon, New Jersey, a suburb of Philadelphia, Pennsylvania. The building also provides structured parking for the tenants' convenience, located below the first-floor level to avoid blocking tenant views.